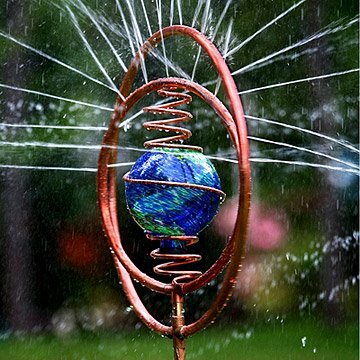 Bring a whimsical water dance to your garden with this kinetic, sculptural sprinkler. Let your sprinkler take center stage for a change with this kinetic sculpture. Handcrafted copper rings and spirals cradle a hand blown glass globe at the heart of each one-of-a-kind composition. It attaches easily to any garden hose to water your lawn or garden while it invites kids and pets to play in the cooling cascade. It's a functional piece of garden decor that makes a mesmerizing focal point for any outdoor space. Handmade by Steve Hopkins in Bothell, Washington. Steve Hopkins hails from a long line of artists, including Jesuit poet Gerard Manley Hopkins, and Canadian artists Frances Ann Hopkins and Elisabeth Hopkins, author of The Painted Cougar, a children's picture book. Growing up on Vashon Island in Puget Sound, Washington, Steve followed in their footsteps, exploring various creative processes and media, including batik, ceramics, photography, and woodworking. In search of a hands-on creative outlet, Steve began making beautiful cedar and copper garden trellises and selling them at his local farmers market. Customers began asking for a certain spiral copper trellis to be made into a sprinkler, so Steve started adding that function to his designs. He enhanced his original designs by incorporating copper spirals and colorful glass balls and began selling his creative sprinklers at home and garden shows, and street festivals. Steve's other interests include summer backpacking trips in the Cascades, rock concerts large and small, and raising his son (who likes to hammer away at copper pipe in his dad's shop while rocking out to Led Zeppelin).